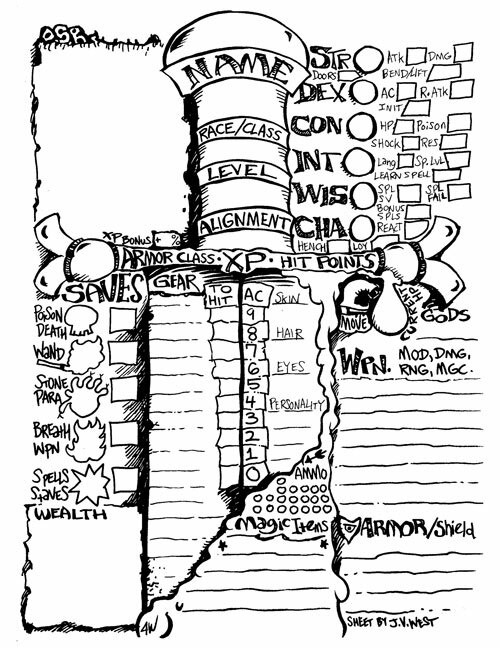 Here's another OSR character sheet for your gaming pleasure. This one features some 1e style ability mods. I recently started a new Labyrinth Lord campaign and one of my players chose to be a Neanderthal. Here are the class descriptions I'm currently using. Enjoy! From out of primordial caves the Neanderthals lumber, club in hand, ready to bash any monsters that get in their way. These hairy "cavemen" with sloped foreheads are similar to humans in height but thicker and heavier all over. They come from wild regions far from civilization. They fear and respect magic. They will not use an item of magic without passing a save vs. spells. If the save fails, they will never use the item, considering it to be sacred (or evil). Neanderthals attack and save as Fighters. They may use clubs, stone axes, spears, and hammers and may throw rocks with great accuracy. But when using any other weapon they have a -3 penalty to hit (-5 for bows and crossbows). Neanderthals wear as little clothing as possible and their thick hair and toughness grants them -1 to armor class. They may only wear hide armor but can use a simple shield if taught how to handle it. A Neanderthal may willingly buck tradition and begin to use strange weapons and wear fancy armor. But such a dramatic shift in temperament will rob the character of its natural abilities. Such PCs become Fighters without any special Neanderthal abilities except for the inherent toughness (-1 to AC). Even then, such characters will naturally mistrust magic and must pass the saving throw vs. spells in order to use any magic item. Savagery: Neanderthals attack with primal ferocity and may re-roll any natural 1 when rolling for damage. Stonework: Neanderthals may craft stone axes, spears, hammers, and clubs at a rate of 1 weapon per day, per level. Toughness: When rolling for hit points Neanderthals may roll a number of dice equal to their new level and keep the best die result. They are highly resistant to extreme natural temperatures and dangerous weather conditions and get +3 to save against such effects. Wary Hunter: Neanderthals are good hunters. Their skill in hunting and tracking in the wild is 75% plus Wisdom. Due to their increased awareness they are only surprised on a 1-in-6. Among the thick-muscled Neanderthals are a few wise members who have been taught the ways of the primordial forces of nature and may call upon those forces to produce miracles. These priests of the cavemen, like Clerics, have the ability to cast magic spells sourced from the wild spirits they revere. Like all Neanderthals, the Shaman must pass a saving throw in order to use a magic item. But the Shaman, in their wisdom, gains +3 to the save. Unlike other Neanderthals, the Shaman is more confident in his place as a holy one capable of wielding such power. Neanderthal Shamans use the Fighter's attack values and saving throws. They may use clubs and staves as weapons and may wear hide armor. Like other Neanderthals the Shaman has a -1 to armor class due to toughness and their thick, hairy hide. 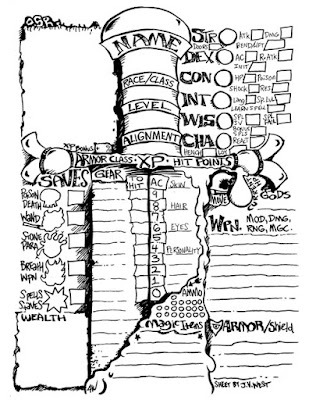 Neanderthal Shamans may cast Cleric or Druid spells per their own spell progression chart. Beast Master: The Shaman may conjure animals once per day. This ability improves to twice per day at level 3 and finally three times per day at level 6. The Shaman may also speak with animals once per day per level. Beast Form: At level 3 the Shaman gains the ability to transform fully into any natural animal of HD equal to the Shaman's level or less. The animal must be common to the Shaman's area of origin. He may do this once per day, maintaining the transformation 1d4 rounds plus 1 round per level. While in animal form the Shaman retains all his mental faculties as well as gaining the general mental faculties of the animal.